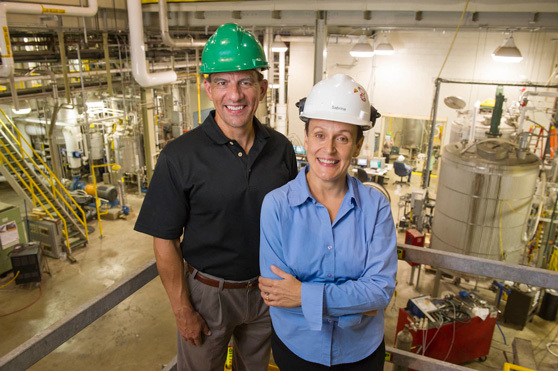 When opening for business more than 10 years ago, The NCERC at SIUE: Advancing Biofuels Research was an entirely different place. There are three major factors that have allowed the facility to become the hub of innovation and enterprise that it is today. Those factors include; the flexibility of its physical building; its connection to Southern Illinois University Edwardsville, and the ability to conduct groundbreaking research and serve private sector clients in an atmosphere that protects anonymity. One of the center's highlights is its fermentation suite. Dr. Sabrina Trupia, assistant director of research, has successfully produced ethanol from corn kernel fiber. Her patent-pending research could be utilized by the 211 existing ethanol plants in the United States and is supported by a recent U.S. Environmental Protection Agency proposal to classify ethanol produced from the cellulosic portion of the corn kernel as an advanced biofuel. In 2009, a need was identified by the Center’s newly-formed technical advisory committee to begin taking steps that would allow it to conduct research in advanced biofuels. Trupia and her team of plant engineers took the initiative to convert a portion of the building’s space into a small scale lab. They created the multifunctional space, which allows the plant’s researchers, as well as private sector businesses, the opportunity to conduct separate trials or run several processes on products prior to having larger batches of an advanced biofuel produced en masse. It was this small scale lab that allowed Trupia to determine that corn fiber from corn waste could be successfully used to produce advanced biofuel. Today, it has the capability to run batches of advanced biofuels in quantities of 30 liters to 1,500 liters.